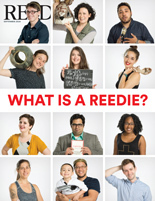 The piece by Katelyn Best ’13 about Reedies still loving the band Talking Heads and their concert film, Stop Making Sense, brought me back to orientation week of my freshman year, 1983, when the movie had just come out and an official field trip was organized for us to see it. I remember being struck by the varied fashion sensibilities of the people in the bus. There were kids like me who came of age during punk rock with jagged hairdos and work shirts with name patches that said “Bill.” There were Deadheads wearing colorful natural fibers. There were gay boys in crisp polos and mod, pegged pants. There were dykes in dungarees. And, of course, there were those kids who looked, for lack of a better description, like scientists. Everyone got on the bus wearing the uniform of his or her distinct tribe. 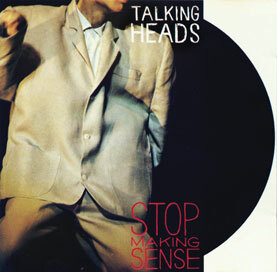 Talking Heads were a special band because they had a little something for everyone. They had a DIY, garage-band sensibility that appealed to the punks, a spaced-out lyrical ambiguity that worked for the Deadheads. They were neat and nerdy yet could sound menacing and crazy. They laid down upper-middle-class art-student concerns to the rhythms of soul and Afrobeat. By the end of the first semester we all were borrowing one another’s clothes. The clique identities that we had worked so hard at cultivating while in high school now seemed less compelling. A punk starts listening to Joni Mitchell because some interesting person living in his dorm plays her at just the right moment. A Deadhead gets into Chinese opera and industrial noise music because her friend has a radio show on KRRC and plays those genres back to back. This is what college should be about: realizing how beautiful the other tribe’s music is, and how fun it is to dance to it. Going to Father Robert Palladino’s [1969-84] calligraphy class was like going on retreat. The classroom was a quiet haven. Normally edgy students were calm as milk. Palladino demonstrated letters with a brush on big pieces of paper, and he put them in historical and aesthetic context. Then he would set us a task and wander the room as we toiled. Sometimes he would talk as he walked, waxing philosophical or telling us about some awful lettering he had seen earlier in the day on the side of a truck. I think a big part of what made it special was that we weren’t expected to talk, or even particularly to listen, but just to focus on plying our pens in a care-taking way. Although I never developed much skill as a calligrapher, I learned enough to forever change my perception of letters in everyday places. I treasure the mediocre little book I made as my class project. And those periods of quiet practice in his classroom helped me through an otherwise stressful time. So here’s to the memory of Father Palladino, with gratitude. Just a year ago in the In Memoriam section I learned of the death of Joseph Gunterman ’34. I was surprised on two counts. I was surprised and pleased to learn that he had had such a long productive life, countering the bromide that the good go young. And I was surprised to learn that he was a graduate from Reed College. I had worked together with him and Emmy in the late 1960s and early 1970s and as an unpaid lobbyist during California legislative sessions. He was obviously a well-educated, cultured, literate man with a broad base of knowledge and many interests, but our attendance at Reed just never came up. He headed up a loose informal group of what he termed “The Good Guy Lobbyists,” representatives of nonprofit organizations with social and educational goals. I was a very inexperienced lobbyist for early childhood education. He and Emmy mentored me, gently guiding, modeling, and informing me about how to be effective. His humanitarian goals for justice with the Friends Committee on Legislation fitted well with my organization’s goals for basic standards for day care and minimum required standards for caregivers. We in the group cooperated by mutually supporting legislative actions that benefited children, farm workers, families, and other social justice concerns and issues. I remember testifying from a child development perspective before a Senate committee about the importance of school nutrition programs for the ability for children to concentrate and learn. Senator Moscone, later to be assassinated with Harvey Milk, joked that maybe the committee members just needed nutrition when they became testy and irritable. At that time the Guntermans were still living on their acreage in Gridley, and Emmy and I sometimes talked about the benefits and trials of rural life. She gave me her recipe for quiche that I still use today. Her chickens were good producers! It was through Emmy’s connections that I became involved in providing child care at a Sacramento Catholic church for the children of César Chavez’s farm workers after their 1966 march to Sacramento. Joseph Gunterman and his wife Emmy Gunterman were thoroughly good human beings. They not only had concerns for their fellow beings, they effectively acted on their beliefs. They helped me learn how to advocate for my own beliefs. I am most privileged to have known and worked with them both.